Besides numerous other reasons relating to affairs of state to keep Hillary from succeeding Obama, her deteriorating physical, mental and emotional health should automatically disqualify her. Her illness is incurable, worsening over time, perhaps incapacitating her in office or killing her if she becomes America’s 45th president. 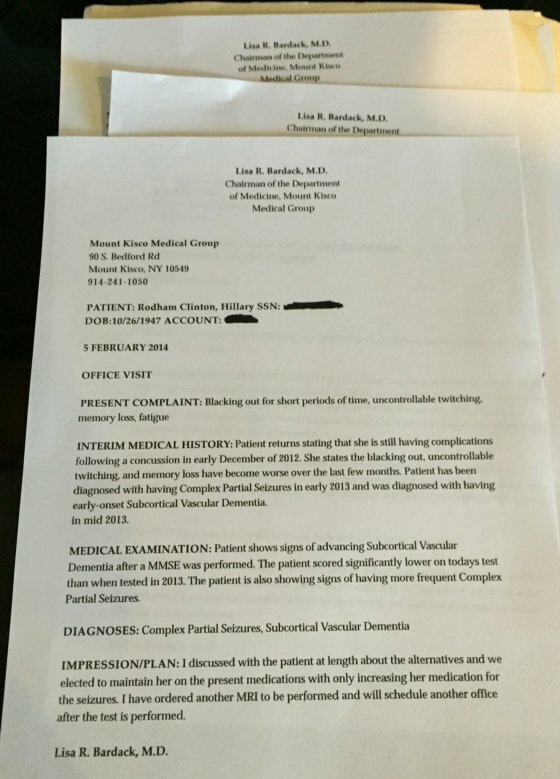 In February 2014, Mount Kisco Medical Group’s Dr. Lisa Bardack, Hillary’s doctor, wrote the letter below, clearly indicating she’s unfit to serve for medical reasons. Presidential illnesses aren’t rare. Noted US heads of state took ill in office, became sidelined, couldn’t perform their duties properly, or at times at all. Woodrow Wilson was America’s 28th president. He served two terms from 1913 – 1921. His health was a state secret. In November 1912, he was elected president. In March 1913, he took office. Few knew his health history. In 1896, he suffered a stroke. It caused marked right upper limb weakness. Sensory disturbances affected his fingers. For almost a year, he couldn’t write. In 1904, he developed right upper limb weakness. It lasted months. In 1906, he lost vision on his left eye. He had multiple neurological problems. He experienced double vision. He had severe episodic headaches. They lasted days. Hypertension and atherosclerosis affected him. In summer 1918, he was frail. He suffered breathing problems. Much worse lay ahead. On October 2, 1919, he collapsed. He experienced a debilitating stroke. For the rest of his presidency, he remained in seclusion. He was sidelined unable to govern. He was dying. Few knew. His top officials and congressional leaders weren’t told. His personal physician, Dr. Cary Grayson, said nothing. The public was entirely shut out. He served two full terms. He hung on longer than expected. On February 3, 1924, he died. Franklin Roosevelt served from 1933 – 1945. In 1921, poliomyelitis left him paralyzed below the hips. In the 1920s, an enlarged pigmented lesion affected his left eye. Some believed it was malignant melanoma. In 1944, he was too ill to run. He was advised to step down. In January, he complained of headaches. He was visibly tired. Once he blacked out at his desk. He was gravely ill. He kept it secret. In March 1944, he developed heart disease and high blood pressure. His condition worsened. Congestive heart disease affected him. He was in no condition to serve. He ran in November. He was reelected. On April 12, 1945, he died. A state-sponsored assassination ended Jack Kennedy’s presidency. Had he lived, his health might have undone him. At age two, he nearly died from scarlet fever. He contracted measles, whooping cough, and chicken pox. He had upper respiratory infections and bronchitis problems. In 1935, he experienced jaundice. His weak physique caused multiple sports-related injuries. His mother called him “a very, very sick little boy.” In the 1930s, he began taking steroids for colitis. Complications followed. They included duodenal ulcers, back problems, and underactive adrenal glands – called Addison’s disease. In 1947, his Addisonism was diagnosed. At the time, he was told he had a year to live. He was given his last rights. As a WW II naval officer in the Pacific, he experienced malaria. The 1960 presidential campaign exhausted him. As US senator and president, his health was kept secret. Few knew what later was revealed. In June 1956, he was my commencement speaker as a junior Massachusetts senator. His memorable address, erudite and thoughtful, unlike how today’s politicians speak, inspired me to write about what he said many years later in my current career – going strong in my 9th decade thanks to two special doctors I call my dynamic duo. Ronald Reagan served from 1981 – 1989. Before becoming president, he suffered from severe nearsightedness, fractures, urinary tract infections, prostate stones, hearing loss, temporomandibular (jaw) joint degeneration, osteoarthritis, and a trans-urethral prostatecomy. He had a history of benign prostatic hypertrophy. He experienced prostatis and skin cancer. In January 1981, he took office. In March, he was shot. Loss of blood alone might have killed him. Emergency surgery saved him. He never fully recovered. Early in his presidency, Alzheimer’s disease symptoms surfaced. They worsened. He forgot cabinet officer names. On a Brazil state visit, he toasted the people of Bolivia. He served two full terms. He lived to age 93. Other US presidents experienced serious health problems. John Adams was diagnosed manic depressive. James Madison suffered from epilepsy. He had high fevers. It left him “deranged” for weeks. George Washington experienced Klinefelter syndrone. Thomas Jefferson suffered from rheumatoid arthritis. Chester Arthur had chronic renal disease. Lincoln, Franklin Roosevelt, Kennedy, William Henry Harrison, Zachary Taylor, James Garfield, William McKinley, and Warren Harding died in office. Presidents are mortal like ordinary people. They get sick like we do, at times seriously. If Hillary succeeds Obama, most likely at this stage of the campaign, will she be the next US president to be incapacitated or die in office? Will her deteriorating physical, mental and emotional state result in catastrophic policy decisions?